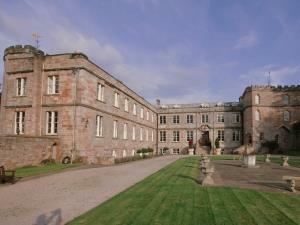 Appleby Castle Guest AccommodationSituated at the foot of the Pennines on the edge of the Lake District Appleby Castle is one of most beautiful castles in the North of England with its dramatic architecture and stunning views. Steeped in history dating from Roman times Appleby Castle is one of the few Norman Castles in the UK that allows you to experience living history by staying in the bedrooms and using the historic rooms. The spectacular Motte and Bailey castle cherishes one of the few intact Norman Keeps in the country. There are twelve luxurious bedrooms in the castle each with their own character. All bedrooms are decorated with antiques and period furniture. 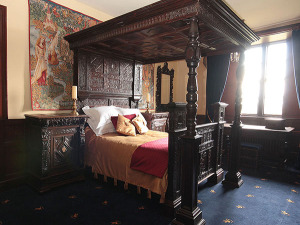 The State bedroom features two 16th century four poster beds with all walls adorned with 16th century tapestries and an ensuite bath room. Other bedrooms feature 17th century four poster beds and seven have ensuite bathrooms. Five rooms have their own large exclusive bathrooms across the hallway in this Grade One Listed Heritage Property. Some bathrooms feature underfloor heating, roll top baths and walk in showers. There are also three luxurious self contained holiday cottages in the Inner Bailey adjacent to the Norman Keep. There is free Wi-Fi throughout the property with a tavern selling local ales in the evening. Appleby Castle is fast becoming a destination for food lovers and drink connoisseurs alike with a choice of fine dining or private dining. Executive chef Andrew Fox heads a team producing exceptional cuisine using his own very innovative flair. Based in Cumbria and with over 18 years experience, working amongst Britain’s best chefs, Andrew shares his talent and passion to deliver mouth watering food in unsurpassed surroundings. Appleby Castle is centrally located within easy access of the Lake District, Hadrian's Wall, Durham and the Yorkshire Dales. The river Eden runs through the property and our guests enjoy exclusive private fishing privileges just 150 metres beneath the ford. There is an abundance of wildlife with many red squirrels and many walks available. All guests are invited on a complimentary guided tour of the interior of this ancient castle. Experience living history - stay in luxury in a English Castle that boasts one of the finest Norman Keeps in the UK. Situated beneath the Pennines on the edge of the Lake District Appleby is one of most beautiful castles in England. The Clifford bedroom is situated along the hallway and is the bedroom of choice for newly weds. Decorated in the medieval style with wall hangings covering all walls the room is dominated by a large seventeenth century king size bed. The window view overlooks Inner Bailey and antiques surround the room. Two steps across the hallway is a large bathroom with a roll top bath and separate shower. The Evidence room is also situated in the North East tower, close to the State Bedroom and overlooking the Pennines and River Eden. This room is dominated by a luxurious 17th century four poster oak bed with traditional Westmorland carving. Other features include antique wardrobe and furnishing and an ensuite bathroom. The Hothfield room is situated on the southern corner of the castle and overlooks the 12th century Keep and the Inner Bailey. This room features a double brass bed with the option of separating out to two single mattresses and an ensuite bathroom. Exit junction 40 on the M6 and travel 12 miles east to Appleby. Appleby Castle it located at the top of the town. Exit at Scotch corner on the A1 and travel 28 miles west to Appleby. Appleby Castle is located at the top of the town. If travelling by train the preferred is via the Settle to Carlisle railway which is one of the nicest journey's in the UK. If travelling by train from London Euston, alight at Penrith North Lakes and get the bus or a taxi to Appleby.